Common names - Vulpia bromoides is known as squirrel-tail fescue and V. myuros as rat’s-tail fescue. Species of silver grass have a wide range of common names, which are detailed in the table below. There are several species of silver grass (that is, grasses in the Vulpia genus). They are all slender annual grasses with fine (0.5-3.0mm wide) hairless leaves. Silver grass has a membranous ligule, no auricles and slender hairless stems. The seed head is a narrow, one-sided panicle containing numerous seeds that have a straight terminal awn up to 14mm long. In the early seedling stages of growth silver grass can be confused with annual ryegrass (Lolium rigidum) and toad rush (Juncus bufonius). Toad rush can be distinguished from silver grass by the absence of a ligule and by fleshy leaves that arise from the base of the plant. Annual ryegrass can be distinguished from silver grass because of the shiny lower surface of its leaf blade, larger wider leaves (especially when there are more then three leaves) and the presence of auricles. There are four species of silver grass in Western Australia (see Table 1). Most sites in the WA wheatbelt where silver grass is found (approximately 90% of sites) contain more than one species. Further, there is an immense amount of genetic variation within a single species of silver grass. 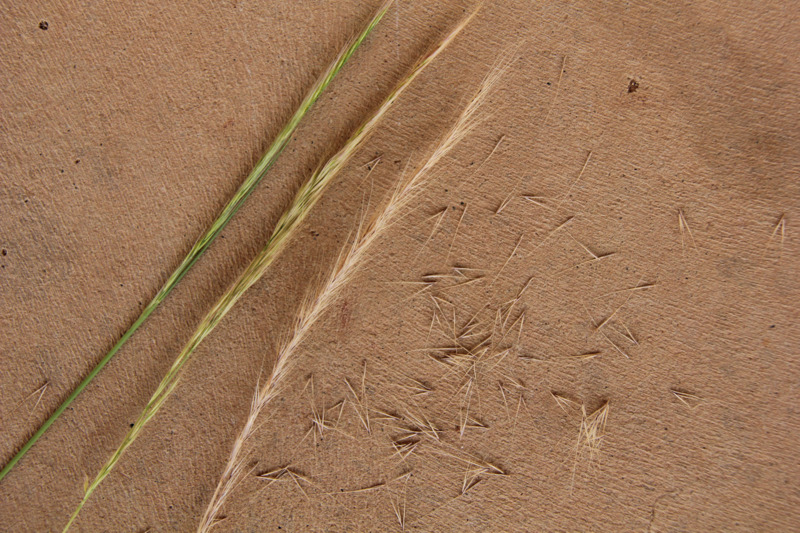 The common name(s) and scientific name of each species of the Vulpia genus found in WA, as well as a description of the seed head, habitat type and how often each species is found in a Vulpia grass sward (for those crop and pasture fields in WA that contain a sward of Vulpia grasses) can be seen below. The seed of silver grass has an after-ripening period of 2-3 months in the field, after which germination can occur (given adequate moisture) over a wide range of temperatures (approximate range of 10-30°C). The seeds emerge from the soil surface or from a depth of approximately 10mm. Emergence reduces with increasing burial depth, and seeds buried at depths of greater than 50mm are unlikely to emerge. Due to the wide temperature range for germination, seed can emerge in the field at any time during the year, providing sufficient moisture is available. Silver grass is most likely to be present in paddocks that are cultivated before the autumn break (that is, autumn tickle) as the seeds germinate rapidly from cultivated soils. Approximately 80-90% of the seed will emerge at crop seeding (May-June), although germination/emergence can be less than 30%, depending on the environment in which the seed develops. The seeds can persist for at least three years, but in the right conditions of moisture, over 95% of the seed will germinate in the first year and only a very small percentage will remain dormant to germinate in following seasons. Crop competition: While silver grass is less competitive than other annual grasses such as wild oats (Avena fatua) or annual ryegrass (Lolium rigidum), silver grass at high densities can severely reduce crop yields. Allelopathic effect of residues: The degraded residue from a dense stand of silver grass in a pasture may affect the germination and biomass production of some crops (wheat, but not canola). This effect is most apparent after a dry summer-autumn period, where minimal soil disturbance maintains the residue on the soil surface. Heavy residues can be burnt in autumn to reduce the effect. Host for diseases/pests: Silver grass is an alternate host for cereal root diseases, including take-all, crown rot, rhizoctonia, bare patch and common root rot. It can also host the crop pest webworm Hednota spp., as well as the nematode that causes annual ryegrass toxicity. Pasture weed: Silver grass will compete with desirable pasture species, particularly at establishment. It has low biomass production during autumn-winter, and low palatability and nutritive value in late spring and summer. Livestock avoid grazing silver grass after seed heads emerge. Further, the awned seeds of silver grass are a source of wool contamination and can seriously injure livestock by penetrating the skin and lodging in the feet, eyes, ears and mouth. There are no confirmed cases of herbicide resistant silver grass in WA (although there are cases of paraquat resistance in other states). However, many herbicides provide suppression rather than control of silver grass and some herbicides only control surface germinating seeds. For details, check the herbicide label. Silver grass seed has little dormancy. A study in southern WA found that 97% of the seed at two field sites emerged in the first few months of the first growing season after seed set, and the seed bank did not persist after that. So early control of the initial flush of germination is highly effective.